Despite some strong competition, the iPhone continues to be the main smartphone of choice for the design world. Apple's pocket-sized marvel can be a pretty handy design tool. Combined with the best iPhone apps, it can pack some real punch in the studio – and more importantly, out of the studio. So whether you plan to do some sketching on the move, are after a particular tool to aid your daily design work, or prefer to take things more seriously with something to help you manage your projects, time and money, there's a great selection of must-have apps right here. A venerable iOS classic that's received loads of updates along the way, Tayasui Sketches is perfectly built for sketching on the iPhone and comes with everything you need to create beautiful images. It's free to download, and if you need more tools to play with you can upgrade to the Pro version for $5.99/£5.99 and get your hands on extra brushes, unlimited layers, gradients and the ability to save your favourite palettes, plus more. Packed with all the power that designers have come to expect from Adobe, this app also includes all the popular drawing tools and features from Adobe Ideas. 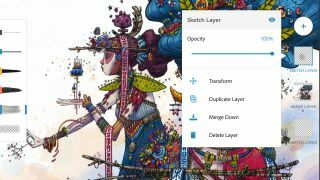 Adobe Illustrator Draw is filled with everything illustrators need to send layered and flat artwork, letting you draw with vectors; access high-res, royalty-free images; and sync assets to appear in your workflow wherever you need them. Draw while on the move with Adobe Photoshop Sketch, using a host of brushes, pencils, pens and markers. The iPhone app harnesses the power of Photoshop’s painting engine, and enables you to import brushes too, giving you all the textures and blending effects you’d get on paper. Packed with features, is this the ultimate iPhone video camera? FiLMiC Pro is, quite simply, the answer to the frustrations that filmmakers have with Apple's default camera app. The most obvious and immediately useful features are the ability to set the focus and exposure separately, to lock them individually, and to lock the white balance. They're all vital for getting the tone and mood of what you're filming right, and FiLMiC knows that. Video nuts will find wide-eyed glee in the ability to specify not only what resolution it films at, but also the framerate and, best of all, the bitrate, so you can record at quality far beyond the Apple defaults – great if you're filming lots of motion. Coming off like a grown-up take on Fuzzy Felt, Assembly earns its place in the best iPhone apps list by enabling user to easily create beautiful vector imagery without having to master Illustrator's tricksy ways. Rather than painstakingly creating your own vector shapes, you can dive into Assembly's library of over 1,000 basic shapes that you can then fit together to make larger designs, either over a plain backdrop or on top of a background image. It's a building-block approach to design that might sound a little simplistic, but it's been put together intelligently and with just enough tools to enable you to craft detailed images in minutes, and is perfect for creating designs when you're on the move. Built on the feedback of mobile artists, Layers is a natural media painting application for the iPhone and iPod Touch. Featuring Photoshop compatibility, a selection of brushes, full colour, paint, erase and smudge tools and the ability to add five layers to your drawings, this nifty little app has everything you need to be creative on the go. This official app from the undisputed kings of colour acts as a digital swatch book, including over 10,000 colours from the Pantone Plus Series and beyond. You can use it to match hues from photos, generate harmonious colour palettes and then share them, or sync them with your design software programs of choice. Capable of capturing and connecting your notes, photos and sketches, Paper is one the best iPhone apps out there for designers – acting like a digital wall of sticky notes for your phone. Thanks to unique swipe-to-style formatting, Paper lets users quickly create checklists and notes, as well as clarifying details in photos. With the original iPad app crowned Apple's App of the Year back in 2012, this version for iPhone is a completely free must-have for designers. Comp CC turns your rough shapes and lines into crisp graphics, letting you create layouts on your iPhone using natural drawing gestures. You can pull in colours, images and vector shapes from your Adobe Creative Cloud Libraries, plus fonts from Adobe Typekit, and then send your comps to Photoshop, Illustrator, InDesign or Muse to finish when you’re back in the office. Create captions and overlay them onto photos with the typography app Font Candy. Choose from an array of hand-picked fonts to liven up your pictures and shoot snaps with a built-in camera with timer, which is perfect for taking selfies. One of the best iPhone apps for pro photographers, Exify is a bunch of tools rather than a camera or editor. Fire it up and you can quickly delve into the fine details behind your pics: lens info; image size; colour space; exposure. There are graphs for histograms, location and time details, and also a magnifier for getting up close and personal with every little detail of your iPhone snaps. Abode Preview CC does one job – and it does it well. This handy iPhone app lets you preview designs for websites and mobile apps. Changes you make in Photoshop CC will appear in Adobe Preview CC in real time, and you can preview upside down on an iPhone as well. Create cool photo collages for free with iPhone photography app Fuzel. With a wide variety of features and smooth UI, you can combine photos, add effects and write captions. The app imports images and cleverly places them so they fit within the chosen frame. You can then tap on any photo and realign, pinch to resize, add various filters as well as chose from different frames and borders. Nearly three million people use Draw Pad Pro for their note-taking. Created by Fishington Studios, the iPhone app offers a new way to get down your thoughts. Users can create sketches and scribbles, customise them, and then organise them to refer to later. DesignLab, formerly PicLab Studio, is a nifty app for creating those inspiring images that you get all over the internet these days. You know, the ones featuring a photo – probably with at least one retro filter applied – with a helpful aphorism layered over the top in an attractive, friendly typeface. DesignLab makes them an absolute doddle, enabling you to either snap a photo or grab one from your photo library, then go to town on it. A Pro version is also available as an in-app purchase, for $5.99/£5.99 per month. Path On enables you to add funky text to photos in unique ways. You draw the path you'd like the words to take, then type in your message – the text then flows along the path. The custom options are the real killer feature here, with you being able to adjust the font, the letter spacing, the alignment and much, much more. There's a good range of fonts, and playing around is fast and easy. The photo filters are best avoided, but sharing your photo is easy.